Banana bread always reminds me of my childhood. Whenever we had ripe bananas around, my Mom always made a couple loaves. I never liked it with any kind of nuts when I was a kid, but now I love making different ways, with different ingredients added in. I love the almonds and almond extract that's added in this loaf. I like adding almond into any baked goods. It adds such a wonderful flavor. This bread is best with some butter slathered on top for breakfast or snack! Enjoy! Cream together the sugar, butter and eggs until combined. Then mix in the buttermilk, almond extract and bananas until combined. After that, mix in the soda, powder and flour until combined. Last, mix in the almonds. Pour into a greased bread pan and bake for 1 hour, until toothpick inserted comes out clean. Cool then remove from pan. This looks so good! I love a good banana bread. This looks so easy and good! Would be great with a cup of tea or coffee. YUM! I love a great quick bread. I think this sounds fantastic. Making soon! Thanks! I sure do love a good quick bread. Heck. Who am I kidding? I love any kinda bread... a little too much! This looks delicious! We love banana bread here (especially Grumpy). This looks absolutely beautiful and delicious. I'm a sucker for banana bread but haven't ever tried it with almonds - looks delish! I seriously love anything that is baked with almond extract! It adds such a great flavor. This bread looks delicious! I love the idea of almond extract, which I've grown to love so much! I generally prefer my baked goods without nuts, but I haven't tried banana bread with almonds. I'll have to try it myself and maybe change my mind! 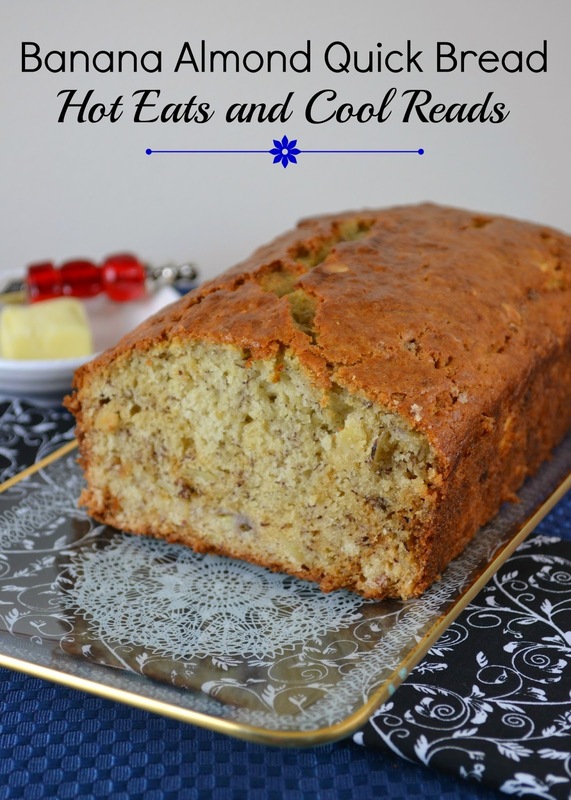 I have been looking for a good banana bread recipe and this looks like it! I love the addition of almond extract! I'm a massive fan of almond cakes so I'm questioning why I have never added any to my banana bread! Thank you for bringing this to my attention. I love your idea =) p.s. found you via Foodie Fridays.